It’s nearly impossible to say that any one hunter hunts just like another. Whether it’s spot-and-stalk to all-day stand sits, or food sources to bedding area priority, rarely do we have a blueprint that hunters follow when it comes to their entire season. Where I grew up in Pennsylvania, rifle season often involved man-drives. When I lived in Mississippi, it was dog-drives. It was just the culture and tradition. It wasn’t until I moved to Kentucky that I heard the words “baiting for deer” and “legal” in the same sentence. Coming from my deer hunting culture, even though it was legal, it still had a weird feeling when I even thought about doing it. It was burned into my head that baiting was not only illegal; it was cheating. I had corn out during the off season for trail cameras, but not to hunt over. There was absolutely nothing wrong with it, but it just didn’t sit right with me. For many hunters, the thought of baiting deer with corn, apples or even minerals is “cheating.” If you have only hunted an area in which these are outlawed, you can’t help but think that way. Similarly, I have had many people look at me like I’m “dirty” when I reminisce on the deer drives of Pennsylvania deer seasons past. No one, in either case, is right or wrong. If it is a legal method, then there is no issue. Even more, it is all based on the culture in which you were raised to deer hunt, nothing more than that. Those that claim “baiting” is an unfair advantage may be right. 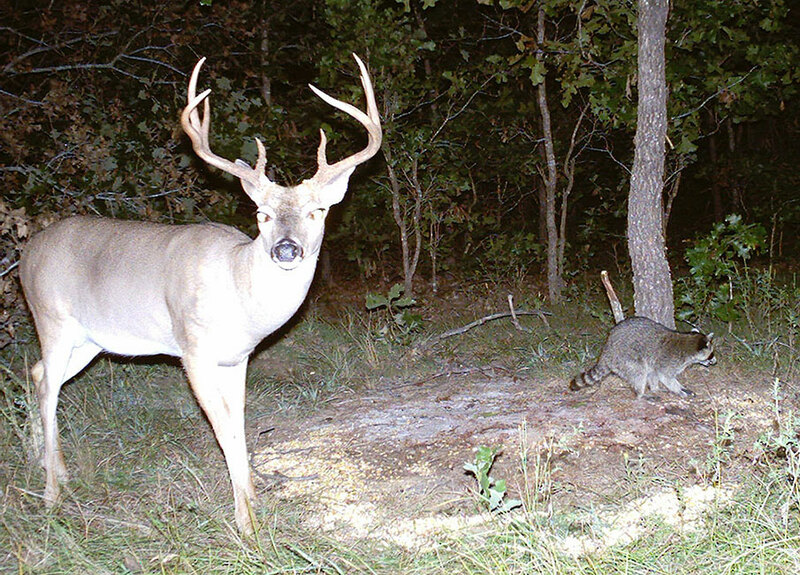 However, a lot of research shows that baiting forces deer to become more nocturnal, which decreases your chances for a harvest. As a biologist, I will be the first to say that I don’t care how much corn you have, if there are acorns falling, then deer are not coming to a bait pile. It was just a couple of years ago when I traveled to hunt the big buck state of Kansas, in which I realized the extent of baiting as part of the deer hunting culture. I walked into a feed supply store to buy a bag of corn to put out on the place I was hunting. When I asked for a bag, I was given some odd looks. Instantly, I thought they looked at me as a cheater, not a real hunter (my mindset of where I grew up). But then they asked, “Is that all?” with a puzzled look. “Uh … yes.” Apparently, ordering one bag of corn for hunting was amateur in that area; these guys ordered it by the pallet! I’m not going to lie, the first couple days of having corn around my stand was odd, but it’s just how they do it. Whether you are picking up apples from a booth alongside the highway in Michigan, grabbing sacks of corn on your way to the stand in Ohio, or throwing out minerals during the early season in Missouri, it all comes done to what you think about it. If it’s legal, then don’t let what others think is “sportsmanlike” affect how you hunt. You don’t have to live up to their standards, only your own.